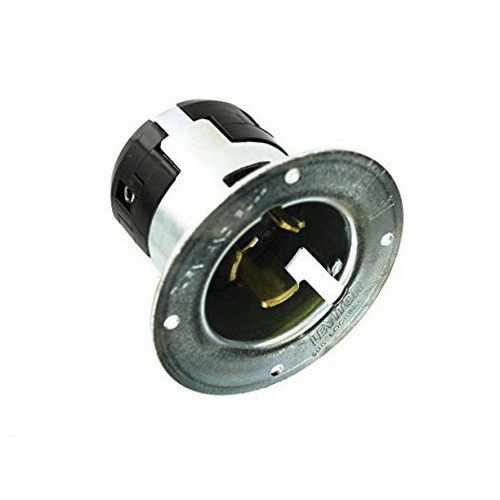 Leviton Black & White® 2.66-Inch Long industrial grade locking flanged inlet in gray metal color, accommodates conductors of size 10 - 4-AWG. It has a dimension of 1.97-Inch ID x 3.5-Inch OD. This 2-Pole, 3-Wire inlet has reinforced nylon construction for impact resistance and secure gripping. It has current rating of 50-Amps and voltage rating of 250-Volts. It withstands dielectric strength of 2000-Volts and temperature range from -40 to 75 deg C. This California-style inlet has ergonomic, fluted-body design with radial gripping edge that is perfect for gripping and pulling. It has 0.062-Inch copper terminal block and stainless steel screws for terminal connection. This Non-NEMA rated inlet with clamp-type wire terminals, has color-coded wire entrance holes for simple, easy wiring. The unique cord clamp connects a broad range of cord sizes, offering a secure grip without damaging the cord. It is UL94-V2 flammability rated to withstand hazardous environmental conditions. Inlet is UL listed, CSA/NOM certified and RoHS compliant.